For as long as I can remember, the Toyota Avalon was the car equivalent of taking a nice nap on a Sunday afternoon. It was soft, cushy, boring and ideal for grandparents who loved their Buicks but got sick of the ’90s General Motors quality. It was one of those cars that, given its demographic, was likely to be the last car someone would ever own. But the world is a different place now and the sedan market is desperate to stay relevant, so here’s a damn Toyota Avalon TRD. Yes, an Avalon... with Toyota Racing Development parts to make it sportier. This is both incredibly bizarre and strangely appealing to me? As a fan of fun, fast luxobarges, this could be cool? But... it’s an Avalon? I’m not real sure what to think here, so let’s work through it together. 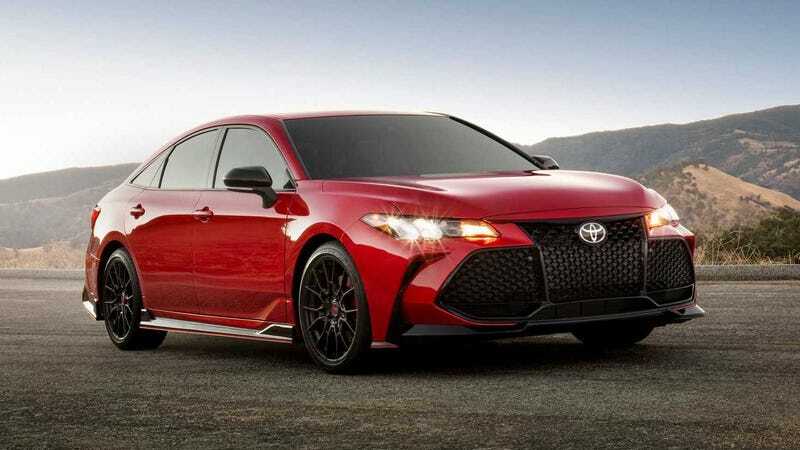 Toyota says that alongside the only slightly more plausible new 2019 Camry TRD, the Avalon TRD gets 19-inch matte black TRD wheels, red seatbelts, a red shift knob, new floormats and some other exterior tweaks. But that’s just the visual stuff. It’s also .6 inches lower thanks to stiffer, sportier springs. It has thicker underbody braces for more rigidity. And it has 12.9-inch diameter rotors and dual-piston calipers on the front brakes. “Brake performance was also tuned to provide more direct feedback, matching the sporty dynamics of the vehicle,” Toyota says. Buhhh? There’s no extra power here, but the Avalon has a 301 horsepower, 3.5-liter V6, so it’s doing fine in that department. Also, it gets a more aggressive-sounding cat-back dual exhaust so your Avalon is nice and loud, just the way you want. I’m not sure why this car exists or who it’s for, but considering what an unexpected blast we had in the latest Camry, it could be fun. Anyway, the Supra races in NASCAR now, the BMW 3 Series is a four-door Supra, the Avalon is a badass sedan with “sporty dynamics” and I don’t know what’s even real anymore so I’m going to bed soon. Goodbye!